Know your copyrights; Who are you? 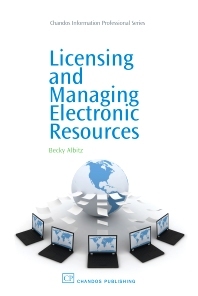 Identifying your institution and its needs; The license; Successfully negotiating an agreement; Selecting and managing titles in your electronic resources portfolio; Model licenses and license alternatives: Conclusion. Libraries are licensing information resources in greater numbers then ever before.In order to negotiate and manage an ever-increasing number of licenses, libraries are either establishing Electronic Resource (ER) Librarian positions, or have been assigning these responsibilities to current staff. In both cases, few resources are available to acclimate new ER librarians to the diverse responsibilities associated with their position. An introduction and practical guide to the standard responsibilities ER librarians address daily. These include: knowing the rights libraries have as consumers of information under United States copyright law, understanding licensing terms and conditions, negotiating licenses to support the specific needs of the subscribing institution, and managing these resources once subscribed. Although every college and university is different, this book provides a framework within which the new ER librarian can learn the basics behind negotiating and managing their information resources effectively. Becky Albitz is the Electronic Resource and Copyright librarian at the Pennsylvania State Unviersity. Prior to this position, Rebecca was the media librarian at the University of Iowa, the media and performing arts librarian at New York University, and the head librarian at Penn State's Shenango Campus. Rebecca has written extensively on film studies resources, media librarianship and electronic resources librarianship. She has also given numerous presentations on electronic resource licensing and copyright. Along with Trisha Davis, Rebecca co-taught the Association of Research.